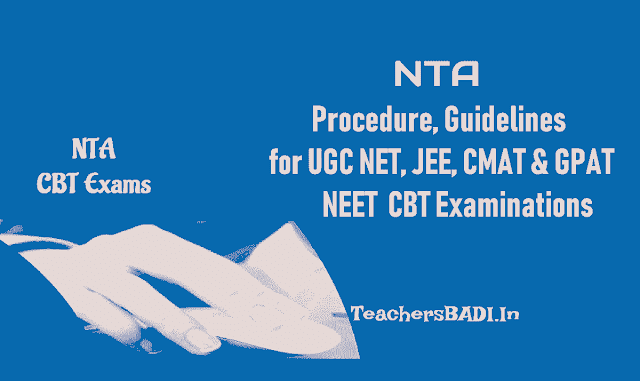 NTA Procedure, Guidelines for UGC NET, JEE, CMAT & GPAT, NEET CBT Exams 2018: National testing agency, NTA organizes UGC NET, JEE, CMAT and GPAT and NEET examinations. NTA released a notification on September 27, 2018 regarding the procedure and schedule of these major examinations. All these exams would be Computer based test, CBT i.e., candidates need to give the exam online on computer within a limited period of time. Here, privide the procedure and general guidelines for UGC NET, JEE, CMAT, GPAT and NEET examinations 2018 and 2019. Check complete schedule and general guidelines for the examination below. Procedure and General guidelines for UGC NET, JEE, CMAT & GPAT and NEET examinations 2018 and 2019: Candidates may download the mock tests available on UGC NET website, ntanet.nic.in to get a clearer idea about the exam pattern. As per the notification released by NTA, the answers can be changed, if required, anytime during the test. To save the answer, candidates must click on the “Save & Next” button and to mark the question for review (without answering it), click on the “Mark for Review & Next” button. Candidate will have the option to change previously saved answer of any question, anytime during the entire duration of the test. To change the answer to a question that has already been answered, first select the corresponding question from the Question Palette, then click on “Clear Response” to clear the previously entered answer and subsequently follow the procedure for answering that type of question. 1. Candidates would be allotted a separate computer. They would be required to enter log in details on the computer of the day of the examination. 2. After login, the candidate shall be able to see the detailed instructions for the examination. 3. Candidates are advised to go through the instructions carefully regarding the type of questions and marking scheme. 4. The countdown timer in the top right side of computer screen shall be displayed. 5. When the timer reaches zero, the examination will end by itself. Candidate will not be required to end or submit the examination. 6. Blank Sheets for doing rough work/calculations shall be provided to the candidates. The major examinations being conducted by NTA will be Computer Based Test (CBT). A CBT requires candidates to sit in front of a computer terminal (node) allocated to them against their Roll number and Admit card. After logging the candidate will get detailed instructions for the examinations. At the designated time of start of examination, the candidates will be able to proceed and see the questions on the computer screen using the computer mouse. Candidates will have the option to change / modify/ edit / answers already entered any time during the examination.